Born and raised in Wyckoff, New Jersey, Hogan played both football and lacrosse for the Raiders athletic teams at Ramapo High School. He was a first-team All-New Jersey performer as a junior and senior in lacrosse and an all-state first teamer as a senior in football. Hogan chose to attend Penn State on scholarship to help build a rising Nittany Lions men's lacrosse program. He started all 13 games as a freshman in 2007, scoring 11 goals, but appeared in just three games as a sophomore because of a high ankle sprain. In 2009, Hogan had 29 goals on 133 shots and was named first-team All-ECAC as well as voted captain for his senior season. He graduated in 2010 with one year of college sports eligibility remaining. Taking advantage of the year of college eligibility remaining after his 2008 ankle injury, Hogan chose to enroll at Monmouth University to play football for its Hawks. He immediately secured a spot as a quarterback/receiver, and also played at cornerback due to injuries in the secondary, and on all special teams units. He finished his one-year college football career with three touchdown passes, 12 receptions for 147 yards and three touchdowns on offense, and 28 tackles and three interceptions on defense. Outside of his speed, Hogan is also noted for his strength as a wide receiver. At his 2011 Pro Day, Hogan pumped 28 reps of 225 pounds on the bench press. Hundreds of receivers have participated in the NFL combine since 2011, and none has matched Hogan's total on the bench as of 2016. On July 27, 2011, the San Francisco 49ers signed Hogan as an undrafted free agent. On September 3, 2011, he was released by the 49ers. On September 12, 2011, Hogan was signed by the New York Giants and was placed on the practice squad. On September 23, 2011, he was released by the Giants. On December 27, 2011, Hogan was signed to the Miami Dolphins' practice squad. On January 3, 2012, he signed a reserve/future contract with the Dolphins. In 2012, he was among the final cuts at the end of training camp, but he was re-signed to the Dolphins' practice squad. On September 11, 2012, his practice squad contract was terminated by the Dolphins. On November 6, 2012, the Buffalo Bills signed Hogan to their practice squad. On December 18, 2012, Hogan was promoted to the active roster. On October 3, 2013, he recorded his first career reception against the Cincinnati Bengals. On October 12, 2014, against the New England Patriots, Hogan caught his first NFL touchdown on an eight-yard pass from quarterback Kyle Orton. Hogan had a breakout season for the Bills in 2014, recording 41 receptions for 426 yards and four touchdowns. In the 2015 season, Hogan played in all 16 games for the Bills for the third consecutive season. He caught his first touchdown of the season in a win against his former team, the Miami Dolphins, and had his best game on a Monday Night Football game against the New England Patriots, catching six passes for 95 yards. In Week 5, against the Tennessee Titans, Hogan threw his first career NFL pass, a four-yard pass to quarterback Tyrod Taylor. The pass came on a drive that fueled the Bills to a 14–13 win. Hogan also had his first career rushing attempt during the season, which went for four yards. Hogan ended the 2015 season with 36 receptions for a career-high 450 yards and two touchdowns. On March 10, 2016, Hogan, a restricted free agent, signed a three-year offer sheet with the New England Patriots for $12 million, with $7.5 million guaranteed. The contract was front-loaded ($5.5 million in 2016) to make it difficult for the Bills to match. This occurred as head coach Bill Belichick saw major potential describing Hogan as a "burner" with incredible athleticism. On March 11, the Bills declined to match the offer sheet,  receiving no draft compensation because of their original minimum salary one-year tender. During a Week 1 matchup against the Arizona Cardinals on NBC Sunday Night Football, Hogan scored the first touchdown of the season for the Patriots on a 37-yard pass from quarterback Jimmy Garoppolo. In the Patriots' Week 5 matchup against the Cleveland Browns, Hogan had a career-high of 114 receiving yards, this time with Tom Brady as his quarterback. In Week 8, while playing against his former team in Buffalo, he caught four passes for 91 yards, including a then career-long 53-yard touchdown reception. In Week 12, against the New York Jets, Hogan became the third Patriots wide receiver in as many seasons to attempt a pass; while Hogan's left-handed pass was incomplete, it drew a 31-yard defensive pass interference penalty. He also passed his previous career-best for receiving yards in a season with 461 yards on 21 receptions (20.1 yards per catch, then trailing only injured teammate Rob Gronkowski for the NFL lead at 21.6). In Week 14, on Monday Night Football, he caught a 79-yard touchdown pass against the Baltimore Ravens, the longest of his career (and the seventh longest in the NFL through Week 14), part of another career-best 129 yards on five receptions. He ended the season with 38 receptions for 680 yards and 4 touchdowns; his 17.89 yards per catch was second only to DeSean Jackson's 17.95. In the postseason, Hogan had four receptions for 95 yards in a Divisional Round win over Houston, followed by nine receptions for 180 yards and two touchdowns in the AFC Championship win over Pittsburgh. These were career highs in all three categories, and a Patriots playoff record for receiving yards in a single game. On February 5, 2017, Hogan was part of the Patriots team that won Super Bowl LI. In the game, he had four receptions for 57 yards as the Patriots defeated the Atlanta Falcons by a score of 34–28 in overtime. In Week 2, against the New Orleans Saints, Hogan had five receptions for 78 yards and his first touchdown of the 2017 season. In addition, he recovered an onside kick in the fourth quarter. By Week 5, Hogan already had a career-best five touchdowns on the season. On October 29, against the Los Angeles Chargers, Hogan injured his right shoulder and had to miss a few games. On December 11, he made his return and recorded one reception for five yards in a 27–20 loss to the Miami Dolphins on Monday Night Football. Hogan helped the Patriots reach the Super Bowl for the second straight season after defeating both the Tennessee Titans in the Divisional Round and Jacksonville Jaguars in the AFC Championship. In Super Bowl LII, Hogan recorded six catches for 128 yards and scored a touchdown along with getting one carry for four yards. The Patriots lost to the Philadelphia Eagles by a score of 41–33. Hogan appeared in all 16 games for the Patriots, but was utilized less than in previous seasons. Despite a promising Week 2 against the Jacksonville Jaguars, where he recorded his second career regular-season game with two receiving touchdowns in the 31–20 loss, he had over five targets in just two games, zero receptions in four games, and failed to break 80 yards in any game. His only other touchdown reception came in Week 15. His 532 receiving yards in the regular season was fifth on the team; he had been fourth in 2017 despite playing just nine games. The Patriots reached their third straight Super Bowl after defeating both the Los Angeles Chargers in the Divisional Round and Kansas City Chiefs in the AFC Championship. Against the Chiefs in the AFC title game, Hogan had five catches for 45 yards, including a one-handed reception on third-and-8 in the fourth-quarter to sustain the Patriots' scoring drive to regain the lead at 31-28. In Super Bowl LIII, Hogan had no catches but the Patriots still won the game by a score of 13–3 against the Los Angeles Rams. On April 12, 2019, Hogan signed with the Carolina Panthers. In 2015, Maximum Human Performance (MHP) announced the signing of Chris Hogan to a sponsorship deal. Hogan is married to Ashley Boccio, a doctor and Long Island native whom he met at Penn State when they were both lacrosse players. The couple has twins, Chase and Parker, born in March 2017. Ashley was pregnant during the Patriots' Super Bowl LI run and could not attend the game, but she did attend Super Bowl LII. While with the Patriots, Hogan stayed in Foxborough, Massachusetts during the NFL season but drove down to his family home in Huntington, New York on Monday nights, spending Tuesday there before returning to Foxborough. ^ Tara Sullivan (January 28, 2017). "Sullivan: Hogan's path to NFL stardom laid in hard work". NorthJersey.com. Retrieved January 28, 2017. ^ "Hard Knocks Creates a Celebrity: Chris Hogan In Demand". The Phinsider. Retrieved December 25, 2012. ^ Rodak, Mike. "Football journey: Chris Hogan", ESPN, September 14, 2013. Accessed December 4, 2016. "It doesn't come as much of a surprise, then, that Buffalo Bills receiver Chris Hogan – a native of Wyckoff, N.J. – chose lacrosse over football. The two-sport athlete, an all-state selection in football at Ramapo High School in Franklin Lakes, was also the 2006 New Jersey Midfielder of the Year in lacrosse." ^ a b c McBride, Jim (June 6, 2016). "Patriots' Chris Hogan took an unusual route to the NFL". BostonGlobe.com. Retrieved November 30, 2016. ^ "BTN highlights Chris Hogan's journey from PSU LAX player to NFL". 247Sports. Retrieved February 9, 2019. ^ Kurtenbach, Dieter (January 23, 2017). "Who is Chris Hogan? Just another incredible Bill Belichick find". FOX Sports. Retrieved December 26, 2017. ^ Walder, Seth. "Both the Jets and Giants had Chris Hogan and let him get away". NY Daily News. Retrieved December 26, 2017. ^ Hanzus, Dan (September 11, 2012). "Chris Hogan of 'Hard Knocks' cut by Miami Dolphins". NFL.com. Retrieved August 16, 2013. ^ "Cincinnati Bengals at Buffalo Bills – October 13th, 2013". Pro-Football-Reference.com. Retrieved December 26, 2017. ^ "New England Patriots at Buffalo Bills – October 12th, 2014". Pro-Football-Reference.com. Retrieved December 26, 2017. ^ "Chris Hogan 2014 Game Log". Pro-Football-Reference.com. Retrieved December 26, 2017. ^ "Buffalo Bills at Miami Dolphins – September 27th, 2015". Pro-Football-Reference.com. Retrieved December 26, 2017. ^ "Buffalo Bills at Tennessee Titans – October 11th, 2015". Pro-Football-Reference.com. Retrieved December 26, 2017. ^ "Chris Hogan 2015 Game Log". Pro-Football-Reference.com. Retrieved December 26, 2017. ^ a b Buscaglia, Joe (March 11, 2016). "Bills decline offer: Hogan headed to Patriots". Retrieved September 30, 2016. 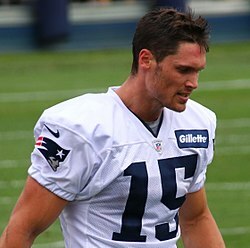 ^ "Spotrac.com: Chris Hogan contracts". Spotrac.com. Retrieved November 9, 2016. ^ "Patriots sign WR Chris Hogan". Patriots.com. March 11, 2016. Archived from the original on March 13, 2016. Retrieved March 12, 2016. ^ "New England Patriots at Arizona Cardinals – September 11th, 2016". Pro-Football-Reference.com. Retrieved December 26, 2017. ^ "New England Patriots at Cleveland Browns – October 9th, 2016". Pro-Football-Reference.com. Retrieved December 26, 2017. ^ "Hobbled Tom Brady and Patriots hand Jets third straight loss". NY Daily News. Retrieved November 28, 2016. ^ "Baltimore Ravens at New England Patriots – December 12th, 2016". Pro-Football-Reference.com. Retrieved December 26, 2017. ^ "Chris Hogan 2016 Game Log". Pro-Football-Reference.com. Retrieved December 26, 2017. ^ Hartwell, Darren (January 23, 2017). "Chris Hogan Passes Deion Branch With Record-Setting Game For Patriots". NESN.com. Retrieved January 23, 2017. ^ "Super Bowl LI – New England Patriots vs. Atlanta Falcons – February 5th, 2017". Pro-Football-Reference.com. Retrieved September 2, 2017. ^ "Chris Hogan now has a Rec TD in 4 straight games, the NFL's longest active streak. His five receiving touchdowns this season are already a career high.pic.twitter.com/iOnuwqabgz". @ESPNStatsInfo. October 5, 2017. Retrieved October 6, 2017. ^ Reiss, Mike. "Chris Hogan returns to practice for first time since shoulder injury". ESPN.com. Retrieved December 26, 2017. ^ "New England Patriots at Miami Dolphins – December 11th, 2017". Pro-Football-Reference.com. Retrieved December 26, 2017. ^ "Divisional Round – Tennessee Titans at New England Patriots – January 13th, 2018". Pro-Football-Reference.com. Retrieved February 9, 2019. ^ "AFC Championship – Jacksonville Jaguars at New England Patriots – January 21st, 2018". Pro-Football-Reference.com. Retrieved February 9, 2019. ^ "Super Bowl LII – Philadelphia Eagles vs. New England Patriots – February 4th, 2018". Pro-Football-Reference.com. Retrieved February 9, 2019. ^ Long, Mark. "Bortles throws 4 TDs, Jaguars beat Patriots in AFC title game rematch". Gloucester Daily Times. Retrieved October 5, 2018. ^ "Chris Hogan Career Game Log". Pro-Football-Reference.com. ^ "2018 New England Patriots Statistics & Players". Pro-Football-Reference.com. ^ "Divisional Round – Los Angeles Chargers at New England Patriots – January 13th, 2019". Pro-Football-Reference.com. Retrieved February 9, 2019. ^ "AFC Championship – New England Patriots at Kansas City Chiefs – January 20th, 2019". Pro-Football-Reference.com. Retrieved February 9, 2019. ^ a b "Cut four times and now playing in third Super Bowl, Patriots' Chris Hogan perseveres". Newsday. February 1, 2019. Retrieved April 17, 2019. ^ Strickland, Bryan (April 12, 2019). "Chris Hogan signs one-year contract with Panthers". Panthers.com. ^ "Daily Notebook: Tuesday Patriots News and Notes 5/9 - PatsFans.com". New England Patriots Blog. May 9, 2017. Retrieved January 30, 2018. ^ "NFL star and podiatric resident welcome twins | Northwell Health". Northwell.edu. Retrieved April 17, 2019. ^ "Chris Hogan and Ashley Boccio: From Penn State to Super Bowl LI". Inside Lacrosse. February 2, 2017. Retrieved April 17, 2019. ^ Orfanides, Effie. "Chris Hogan Praises Wife Ashley Ahead of Super Bowl LIII". Heavy.com. Retrieved April 17, 2019. ^ "Super Bowl LII: Patriots' Chris Hogan is LI's ultimate commuter". Newsday. February 4, 2018. Retrieved April 17, 2019.